PALRAM Curved Roof Canopies in Basalt Grey (RAL 7012) frames. Atlas 5000- Bronze corrugated polycarbonate roofing, Size 4950x 2879mm. Arcadia 5000- Grey 6mm twinwall polycarbonate roofing, Size 4950x 2879mm. These 2 canopies are only available in the sizes and colourways specified. 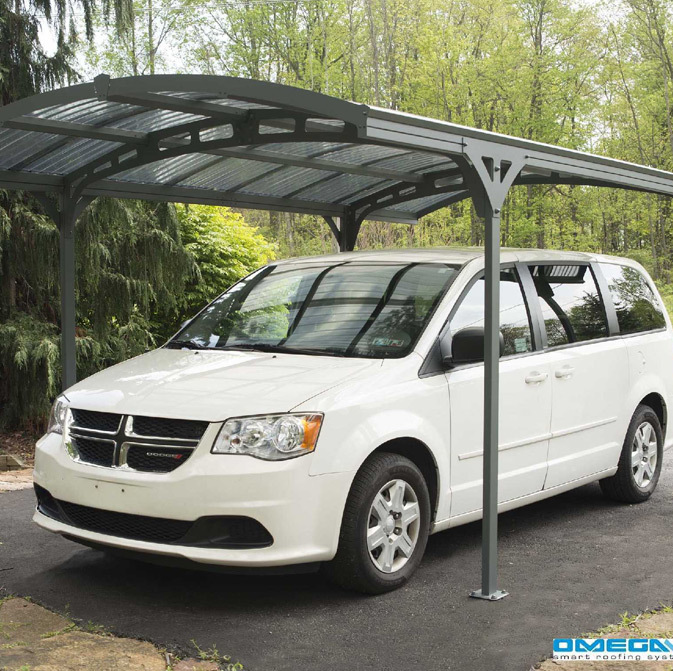 This free standing canopy range provides solutions for Patio Covers, Verandas and Carports. The canopy is guaranteed for 10 years. Installation Instructions are supplied with every canopy. As well as Curved Roof Freestanding Canopy Omega Build supply a range of roofing components such as roof lanterns, roof domes, diy conservatory roof kits, polycarbonate roofing sheets, polycarbonate canopy kits, door canopy kits and much more. I would recommend your affordable products (Curved Roof Free standing Canopy | Curved Corrugated Roofing Canopy) to anyone else considering this product, as it has been superb. Omega Build Shop | Curved Roof Free standing Canopy | Curved Corrugated Roofing Canopy. You are viewing Curved Roof Free standing Canopy | Curved Corrugated Roofing Canopy, buy online today!